Summit was hosted by the President of Bangladesh Hussain Ershad. President of Maldives Maumoon Gayoom. Action Committees: The Standing Committee may set up Action Committees comprising the Member States concerned with the implementation of projects involving more than two but not all Member States. *Formerly the periodic meeting time was 1, 2, and meet as often as deemed necessary respectively. The 18th SAARC summit changed it as above. 1 Secretary-General, 1/1 Directors from each member states and other officers as per need. From 18th SAARC Kathmandu Summit 11 RC convert to 5. SAARC Development Fund (SDF): The 13th SAARC Summit (Dhaka, 12-13 November 2005) decided to establish SAARC Development Fund (SDF) as a comprehensive funding mechanism with the provision of three Windows (Social, Economic and Infrastructure). SOUTH ASIAN UNIVERSITY (SAU): The Agreement for the Establishment of South Asian University was signed by the Ministers of Foreign/External Affairs of the MSs of SAARC during the 14th SAARC Summit (New Delhi, 4 April 2007). SOUTH ASIAN REGIONAL STANDARDS ORGANIZATION (SARSO): The fifteenth SAARC Summit paved the way for establishing SARSO in order to harmonize standards and promote cooperation in the fields of metrology, accreditation and conformity assessment for enhancing the capacity of the respective national institutions in carrying out their technical tasks. The agreement on SARSO came into effect on 25th August 2011. 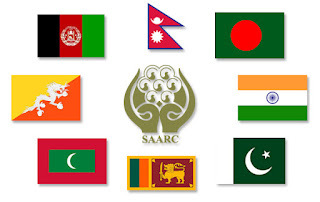 SAARC ARBITRATION COUNCIL (SAC): The agreement on SARCO was signed during the Thirteenth Summit and came into effect on 2 July 2007. SARCO was established with a view to resolving cost-effective settlement of disputes via arbitration within the region. Rajiv Gandhi is the only one Head of Government (PM) to sign in SAARC Declaration. All other are Heads of States. Sri Jayawardenepura Kotte (commonly known as Kotte) is the official capital of Sri Lanka. Sri Jayawardenepura Kotte is a satellite city and within the urban area of Sri Lanka's capital, Colombo. The concept of SAARC was firstly given by Ziaur Rahman (7th president of Bangladesh) and Late King Birendra. SAARC comprises 3% of the world's area, 21% of the world's population and 3.8% (US$2.9 trillion) of the global economy, as of 2015. Till now 2 Secretary General, Yadav Kanta Silwal 4th (1 Jan 1994 - 31 Dec 1995) and Arjun Bahadur Thapa 12th (1 Mar 2014 - 28 Feb 2017) are from Nepal. Landlocked countries in SAARC are 3: Bhutan, Nepal and Bangladesh. The Island countries are 2: Sri Lanka and the Maldives.